A cheap, friendly and reliable Man with a Van service. We guarantee to beat any online van removals quote. London Van Man cover all of the areas listed below – if your pick up and drop off is anywhere in Zone 1, or South London zones 1-2, the prices given above apply. For other areas of London, we may charge a small surcharge. Please see the links below for more information,our cheapest removal price promise, customer comments, and information on obtaining parking permits in the areas listed below. If you click the London Postcode Map, this also shows you where each postcode is. The following list of London Districts shows all the districts we cover. We offer a van man service to the following postcodes: SE1, SE2, SE3, SE4, SE5, SE6, SE7, SE8, SE9, SE10, SE11, SE12, SE13, SE14, SE15, SE16, SE17, SE18, SE19, SE20, SE21, SE22, SE23, SE24, SE25, SE26, SE27 AND SE28. S, Bermonsey,Surrey Docks, Walworth, Elephant & Castle, Woolwich, Plumstead, Crystal Palace, Norwood (Cen & Upper), Anerley, Penge, Dulwich, West, Dulwich, East Dulwich, Forest Hill, Herne Hill, South Norwood, Sydenham, West Norwood, Tulse Hill, Thamesmead. Our removals company cover the following postcodes: SW1, SW2, SW3, SW4, SW5, SW6, SW7, SW8, SW9, SW10, SW11, SW12, SW13, SW14, SW15, SW16, SW17, SW18, SW19 and SW20. This includes the following locations in London: Westminster, Belgravia, Pimlico, Victoria, Brixton, Streatham Hill, Chelsea, Brompton, Clapham, Earl’s Court, Fulham, Parson’s Green, South Kensington, South Lambeth, Vauxhall, Nine Elms, Stockwell, N Brixton, West Brompton, World’s End, Battersea, Clapham Junction, Balham, Barnes, Castelnau, Mortlake, East Sheen, Putney, Roehampton, Streatham, Norbury, Tooting, Wandsworth, Earlsfield, Wimbledon, Merton, Collier’s Wood, West & South Wimbledon, Raynes Pk. This includes: Whitechapel, Stepney, Mile End ,Bethnal Green, Shoreditch, Bow, Bromley-by-Bow, Chingford, Highams Park, Clapton, East Ham, Beckton, Forest Gate, Upton Park, Hackney, Dalston, Homerton, South Hackney, Leyton, Leytonstone, Wanstead, Manor Park, Plaistow, Poplar, Millwall, Isle of Dogs, Stratford, West Ham, Victoria Docks, N Woolwich, Canning Town, Walthamstow, Woodford South. We cover all the Central areas, i.e. EC1, EC2 NE, EC3 SE, EC4 W.
Covering N1 to N22, that is to say N1, N2, N3, N4, N5, N6, N7, N8, N9, N10, N11, N12, N13, N14, N15, N16, N17, N18, N19, N20, N21 and N22. 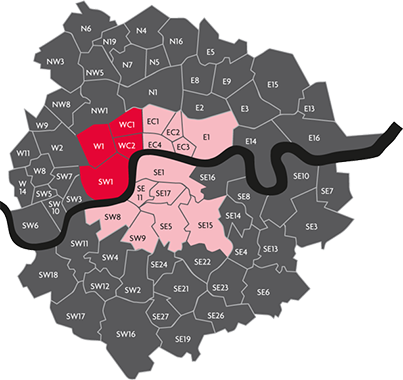 In North West London our movers will move you to NW1, NW2, NW3, NW4, NW5, NW6, NW7, NW8, NW9, NW10 and NW11. Camden Town, Regent’s Pk, N Marylebone, Cricklewood, Neasden, Dollis Hill, Hampstead, Swiss Cottage, Belsize Park, Hendon, Brent Cross, Kentish Town, Kilburn, Queens Park, S & W Hampstead, Mill Hill, St John’s Wood, The Hyde, Kingsbury, Colindale, Willesden, Harlesden, Kensal Green, Golders Green, W Hampstead Gdn Suburb. London removals to W1, W2, W3, W4, W5, W6, W7, W8, W9, W10, W11, W12, W13 and W14. West End – Mayfair, Soho, S Marylebone, Paddington, Bayswater, Hyde Park, Acton, Chiswick, Ealing, Hammersmith, Hanwell, Kensington (central), Maida Vale, Warwick Avenue, North Kensington, Ladbroke Grove, Notting Hill, Holland Park, Shepherd’s Bush, West Ealing, West Kensington. Van Man London Removals and Storage cover all the areas listed above.